Come Away With Me to Vacation at the Glass House BVI Villa on JVD! Come Away With Me to Vacation at the Glass House BVI Villa on White Bay, JVD! A place of endless summers, mixed with easy laughter and the ocean breeze. A luxury private option when looking for a vacation at British Virgin Islands resorts. Stay in our Luxury Glass House BVI on the volcanic cliffs of Jost Van Dyke BVI, where waking up to breathtaking ocean views, is bound to awaken your soul. Enjoy the untouched shoreline of White Bay, a protected cove nestled in the British Virgin Island of Jost Van Dyke. 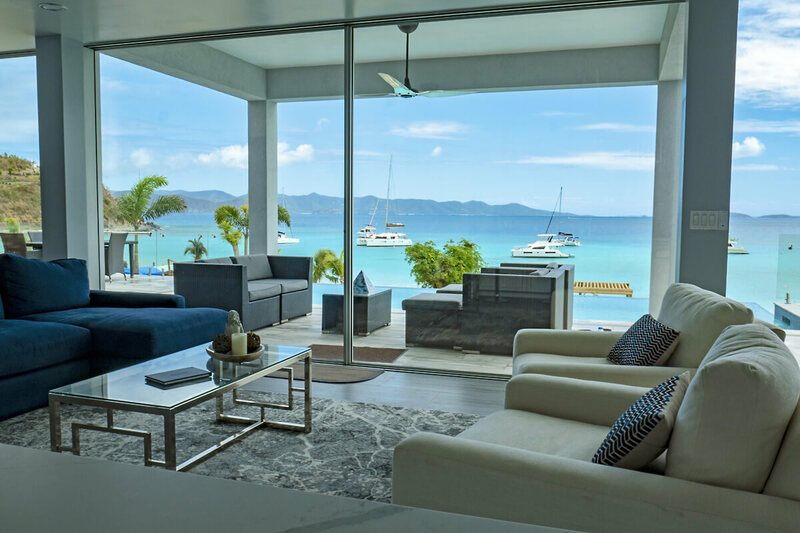 Glass House BVI is one of the most beautiful Jost Van Dyke houses. Our luxury villa provides a quiet retreat off the grid; a place you can call your own. Fly into St Thomas USVI or Tortola BVI and take a short ferry ride across to this tranquil Caribbean Island or sail your private yacht to 18°4463″N 64°7429″W and let Glass House BVI host you. Reconnect with friends and family in a spacious 4 bedroom luxury villa that sleeps 12. Glass house BVI is a beach front property with splendid ocean views, an infinity pool and a place where you will fall asleep to the sounds of the ocean.